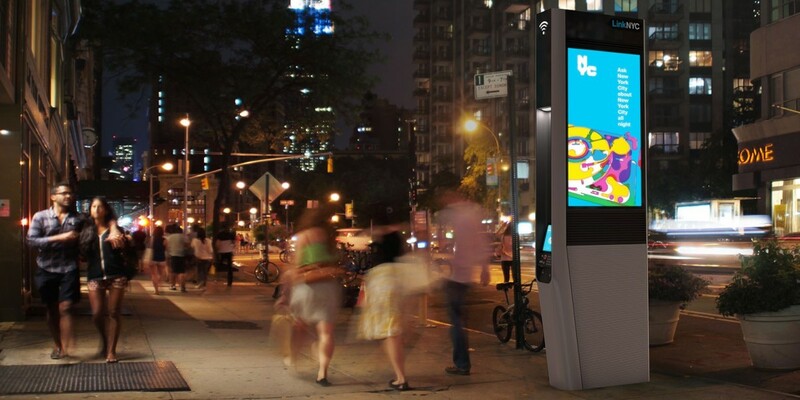 New York’s first LinkNYC public Wi-Fi kiosks, called Links, are now up and running, and users can now enjoy speeds upwards of 300Mbps for free on Third Avenue. For comparison, that’s about thirty times as fast as the internet speeds available to half of all US subscribers. Engadget, The Verge and Gizmodo reported high speeds when trialing the service today. LinkNYC began installing Links last month in the city, but has turned them on for beta testing only today. Currently, four Links on Third Avenue between 15th and 19th Streets are operational. In addition to Wi-Fi, you can also take advantage of the two built-in USB ports to charge up your device as well as a tablet to access the Web and maps. If you’re carrying earphones with a bundled mic, you can make voice calls at no charge too. Engadget reports that each Link offers a wireless range of about 150 feet, but that may vary depending on the walls and strcutures between you and the kiosk. The city plans to roll out 500 ad-supported Links all over town by mid-July, with a final target of 7,500 in total throughout the five boroughs over the next few years. If you get a chance to try a Link, let us know how it works in the comments.